– As published in the December 2013 issue of Estate Planning Magazine. In addition to accomplishing charitable goals, charitable lead annuity trusts (CLATs) can be powerful income tax deduction tools for clients ranging from former executives receiving large onetime income payments from deferred compensation plans or nonqualified retirement plans to professional athletes receiving upfront contract or roster bonuses. CLATs provide a unique opportunity to ease the present income tax burden for ultra-high net worth individuals while enabling charitable giving and leaving individuals or trust beneficiaries with the remaining funds gift and estate-tax free. In its simplest form, a CLAT is the inverse of its brother, the charitable remainder trust (CRT). In a CRT, the primary beneficiary is the donor or a named individual, and then the charitable organization (often a private foundation) is the beneficiary of the remainder. With CLATs, however, additional estate planning benefits can be afforded through the use of creative structuring such as private placement insurance. 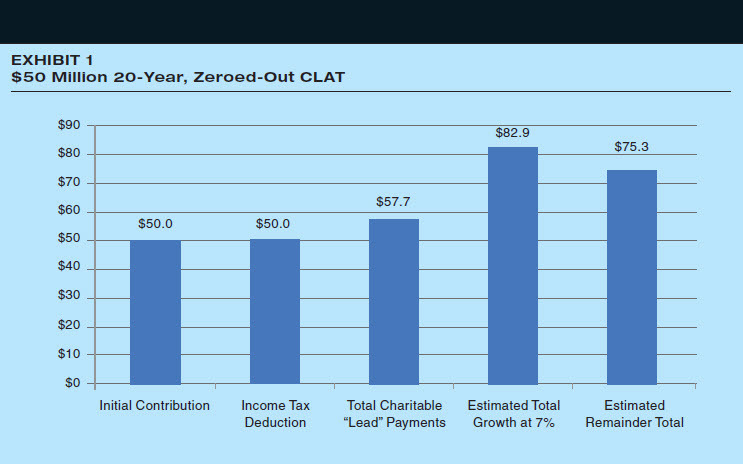 In a CLAT, the up-front income tax deduction is based on the total expected lead payments made to a qualifying charity. The calculated remainder interest for gift tax purposes is the initial contribution reduced by the present value of the lead payments. The IRS-prescribed discount or “hurdle” rate (“Section 7520 rate”) is a favorably low 1.40% (as of July 2013). The actual amount transferred to the remainder beneficiary is based on the underlying investment performance in excess of the lead payments and the 1.40% discount rate. Example. A hedge fund manager is looking to repatriate $50 million of offshore assets, which would create a rather hefty income tax liability. The hedge fund manager could use a $50 million CLAT to generate a $50 million income tax deduction with any remainder passing gift and estate tax-free to an estate tax exempt trust. More specifically, assuming a 20-year zeroed-out CLAT, the hedge fund manager could achieve a $50 million income tax deduction (subject to adjusted gross income-related deduction limits (2)) and pass potentially $75.3 million estate and gift tax-free to an estate tax exempt trust. In addition, there would be an annual charitable contribution of $2.9 million per year. In order to achieve the up-front charitable deduction, the CLAT must be established as a grantor CLAT for income tax purposes. This means that after the initial income tax deduction, all of the CLAT’s income and investment gains bypass the trust and will be recognized on the hedge fund manager’s individual income tax return. This can be a very expensive proposition considering the impact of the American Taxpayer Relief Act (ATRA) and the enactment of the new Medicare 3.8% tax on net investment income. Decreasing the CLAT term reduces the potential tax liability but increases the charitable lead payments and decreases the remainder interest. Liquidations of corpus to fund the charitable lead payment will trigger taxable gains, to the extent of appreciation, with no offsetting charitable deduction (because it was taken up-front). Payments in-kind also trigger taxable gain recognition and hence cannot be employed to avoid this result. 1. CLAT duration is 20-years and solved to have a zero remainder value for gift and estate tax purposes. 2. Annual charitable lead payment is computed based on an assumed Section 7520 rate of 1.40% (as of July 2013) and level annual payments (simplifying assumption). 3. CLAT assets are assumed to appreciate at a net rate of 7% per year based on a hypothetical investment and do not represent any specific investment. 4. Taxes are not assessed to the CLAT balance, as all taxes are born by the grantor assuming the CLAT qualifies as a grantor CLAT for income tax purposes. 5. Investment returns are assumed to be taxed as earned, split 70/30 between income and short-term capital gains and long-term capital gains, with an assumed 43.8% and 23.8% federal tax rate, respectively. 6. Present value discount rate is 3.00% in all scenarios. 7. Hypothetical 20-year level term insurance policy has an annual premium $31,900 payable at the beginning of the year for $15 million of coverage. No assumption was made regarding term conversion or extending coverage beyond the 20-year level term period. Representative 50 basis point mortality and expense (M&E) fee reducing CLAT investment returns (actual M&E fees may be lower or higher)—net return is 6.50%. Annuity income, to the extent of gains, is taxed at a marginal federal income tax rate of 43.8%. Assumed marginal federal estate tax rate of 40% (does not include potential imposition of additional state estate taxes). Single carrier proxy used and may not be representative of all carriers and policies. Assumed 50-year-old male (non-smoker) issued at a preferred rate class. PPLI policy returns are assumed to be 7.00% per year net of investment management fees (hypothetical investment). PPLI end-of-year values include typical and customary insurance policy charges. Policy is funded using five equal premium payments and qualifies as a modified endowment contract (MEC). A MEC is created when the amount by which the contract death benefit exceeds the policy cash value or “amount at risk” is less than the minimum allowed by the IRS. A MEC does not receive the same beneficial tax treatment as a non-MEC life insurance contract in terms of policy distributions. Additional taxes may apply if a MEC life insurance policy is used as collateral. If a life insurance contract becomes a MEC while in force, adverse tax consequences may apply. Private placement insurance products could provide a practical solution for ultra-high net worth individuals and their families looking to resolve the CLAT conundrum. Private placement insurance and annuity products are institutionally priced insurance products made available exclusively to accredited investors and qualified purchasers. As these are non-registered products, there is more latitude in permissible investments than their retail product cousins (and may have additional investment risks). Ultimately, the high net worth individual is trading tax friction for the insurance charge friction, which is the cost of the tax savings. How does private placement insurance fit into and benefit the CLAT equation? The two scenarios are to employ either private placement variable annuities (PPVA) or private placement life insurance (PPLI). Incorporating these solutions into a trust demands sophisticated estate planning, but done right, the impact can be significant. Staying with our hypothetical hedge fund manager scenario, private placement products provide an 18% to 60% reduction in the grantor income tax liability during the initial 20-year CLAT period. The tax savings are further magnified when measured against the cumulative income tax liability to the grantor over his or her lifetime (assuming a grantor trust is the remainder beneficiary). The frictional trade-off is a reduction in the present value of the residual trust value; however, when we account for the long-term impact of the additional tax friction, the holistic net benefit to heirs is increased by 18% to potentially over 80%. The least complex private placement solution is to incorporate a PPVA, which provides low-cost tax deferral. Our hedge fund manager could realize income tax savings of $6.1 million by having the 20-year CLAT invest the proceeds inside of a PPVA on a nominal basis. The remainder value to the non-charitable beneficiary is nominally lower due to the additional charge friction of the PPVA. Accounting for the differential in taxes, PPVAs provide a superior long-term total return to heirs with the ultimate tax obligation back-loaded until the surrender of the annuity or eventual death of the grantor. Annuity withdrawals are taxed under LIFO accounting treatment. Therefore, withdrawals to fund charitable lead payments are taxed at ordinary income tax rates to the extent of gains, and an additional 10% tax penalty may apply for distributions prior to age 59 1/2. Annuities provide income tax deferral only as long as they are owned by a natural person or as an agent of a natural person such as a grantor trust. A mandatory distribution would occur at the grantor’s death which would be a taxable event. If the grantor dies during the CLAT term, there would be both a recapture of the CLAT income tax deduction plus taxes due on the mandatory annuity distribution— a double negative. An intermediate surrender of the annuity is subject to ordinary income tax to the extent of gains. PPLI provides a more complete tax solution at the expense of additional complexity and some cost. PPLI is a true life insurance policy providing both a tax-free death benefit and tax-favorable access to policy cash values (assuming non-modified endowment contract status). Hence, unlike the annuity, the PPLI policy may be retained until the death of the grantor at which time a tax-free death benefit is paid to the remainder beneficiary. It is worth noting that as a true life insurance policy, full medical underwriting is part of the process. Exhibit 2 illustrates this arrangement. Tax exposures of PPLI are different than those of PPVA. The use of life insurance inside of a CLAT requires consideration of the charitable split-dollar rules. (5) These rules preclude a charity from engaging in a life insurance transaction where a benefit inures to a non-charitable beneficiary. Strategies exist to avoid the implication of these rules. In practice, they are the domain of the most erudite estate planners and tax attorneys. From a very top-level perspective, one strategy could be to use a power of substitution to “swap” assets between the grantor and the grantor CLAT after the PPLI policy has been fully funded. A second strategy is to have the CLAT invest the corpus in a limited liability company (LLC) which subsequently invests the funds into a PPLI policy. Further, the CLAT LLC structure can be integrated into additional estate planning mechanics. For example, the CLAT and another estate-exempt trust could co-invest in the LLC. Instead of using a traditional pro-rata share of investment distribution, a preferred return or reverse freeze LLC could be used. In this scenario, a fixed preferred payment rate is paid to the CLAT with any growth in excess of the income preference paid to the common unit holders, i.e. the second trust. Since generation-skipping transfer tax (GSTT) exemption cannot be allocated toward a grantor CLAT remainder trust (due to the potential income tax recapture if the grantor does not outlive the CLAT term), a combination approach as just described could be a means to weight the ultimate remainder benefit between both an estate-exempt trust and more favorably towards a GSTT exempt trust. Given the current tax rules and favorable market dynamics, advisors to ultra-high net worth individuals should consider reviewing grantor CLATs and their potential advantages when implemented with private placement insurance. 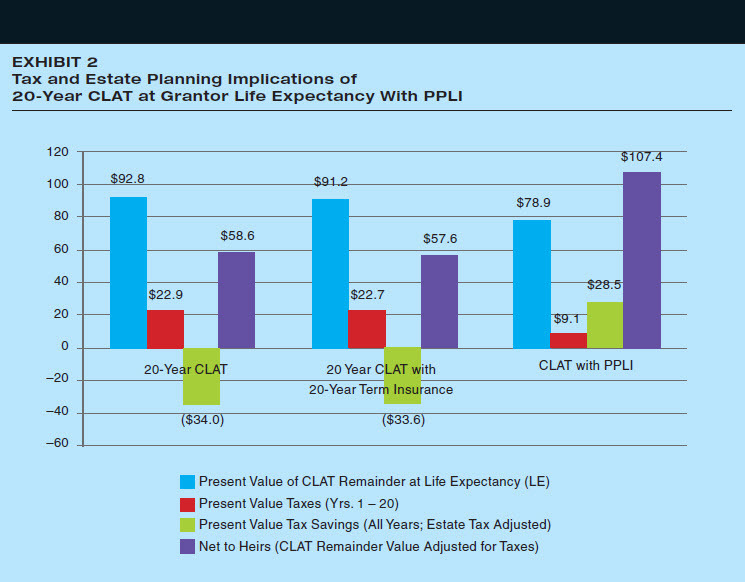 The impetus for immediate income tax deductions may potentially be magnified by the required repatriation of offshore funds by 2017; however, the benefits of a CLAT should be counter-balanced against the increase in both personal and investment tax exposure of the grantor in light of the American Taxpayer Relief Act (ATRA). An effective grantor CLAT needs to be analyzed and implemented with a deft hand, especially when taking advantage of the additional low-cost tax efficiency solutions provided by private placement insurance. Due to FINRA regulations, a hypothetical term insurance policy must be illustrated in conjunction with the CLAT in order to compare the benefits of owning a PPLI policy inside of the CLAT. The author concedes that in reality, a term insurance policy would most likely not be purchased inside of a CLAT. Please contact us if you would like hard copy reprints of this article to share with clients and/or associates. When we last visited M Financial Group (see “A Class Of Its Own,” Private Wealth, October 2008), the sun was shining brightly on the high-end producer group headquartered in rainy Portland, Ore. But our interviews were conducted just weeks before the financial crisis struck. After the crash, the high-net-worth insurance landscape looked different. Did the change take M down a peg? “Since 2008, our member firms have written over 25%—probably approaching 30%—of all the life insurance we’ve sold in our entire 35 years,” smiles Fred H. Jonske, president and CEO of the 140-firm collective that claims to sell more life insurance to the ultra-affluent than any other distribution system. Clients are smiling, too. Their premiums on M’s exclusive policies have been reduced by $110 million post-crisis. Through risk-sharing as a reinsurer (see “Reinsuring Wins the Game,” below), M wields so much influence with the carriers it partners with—John Hancock, Prudential, Pacific Life, Unum, Nationwide and TIAA-CREF Life Insurance Company—that when policies perform better than expected, the lower costs get passed on to M clients via reductions in their premiums. A nine-figure premium cut is a heap of savings in any economy, let alone an uncertain one. Results such as these sprout from M Financial Group’s ability to take change in stride, literally. One of the organization’s significant ongoing activities is monitoring the high-net-worth marketplace to stay on top of where it’s headed. “At any given point in time, we’re looking two to five years down the road, trying to anticipate what we should be doing to keep us ahead of the crowd, whether it’s a new alliance, product or business line,” Jonske says. “The tactics are many,” Jonske says in describing M’s market-intelligence effort. Perhaps the richest data comes from M’s field force—the 700 or so frontline advisors at M member firms who market to clients and hear their needs and wants firsthand. The manageable size of the advisor army allows M to rely more on personal interactions with them and less on things such as surveys and data mining, according to Byrne. So a quartet of Chartered Life Underwriters from the home office, dubbed “sales support,” makes carefully planned visits to the member firms, arriving with a busy agenda and a laundry list of pointed questions. What trends are emerging in your marketplace ? What are people buying? What resistance points are you seeing? There’s also pre-visit homework. Before heading out, sales support checks with M’s various business units to see if the member firm has reported any issues that demand attention. Perhaps there’s an issue with product development. Or branding. Or underwriting. Or technology. If so, an expert in that particular area may join the visiting team. Different information is procured from outside the M family in exchange for its knowledge of the ultra-high-net-worth arena. Weekly calls and twice-yearly conclaves with the carrier partners focus on industry developments, market demographics, product issues and more. “Carriers have a different view of the market than we do and different resources,” Byrne notes. Meetings with the credit-rating agencies provide still another perspective. “The agencies certainly influence carrier behavior and they influence buyers with their ratings. So our actuarial and finance staff meets regularly with analysts at the major rating agencies to get their observations and thoughts on the industry,” Byrne says. Relationships such as these can pay off in myriad ways. For instance, some months ago The New York Times, read by many a wealthy M client, wrote a disparaging article about captive reinsurers. M didn’t agree with the piece and got on the horn to Moody’s for their take. “We learned directly from the rating agency that captives are considered as part of the rating process. Regulators understand that captives are being used and generally do not view them as a problem,” Byrne says. M advisors were then able to share this comforting news with their clients, who had found the Times article concerning. To complete its wide-angle view of the insurance market, M culls industry details from trade publications and conference proceedings and speaks with stock analysts. The cornucopia of data then flows to more than a dozen M committees, such as the product development group. It was this very process in the financial crisis’s aftermath that led to the formation of M’s most recent carrier alliance, with TIAA-CREF Life Insurance Company, in 2011. In the wake of the crisis, affluent clients placed increased emphasis on the financial strength of financial institutions, M learned. “We got a lot of data from our firms and coalesced it for the product development group, which consists entirely of key membership—large producers and M board members,” Byrne says. “The committee prepared a broad outline of what the marketplace needed. Then management went out, sought opportunities and came back with TC Life, a triple-A-rated company that only wants to do business in the high-net-worth marketplace with M and which will design and price exclusive products for us based on the experience database we have from reinsuring what we sell,” Byrne says. What’s M crystal-balling now? The client of the future. So far, M has concluded that future clients will seek out information on the Web. “Even though they will want a trusted advisor to help them, they’re going to go to the Internet for verification. So to some extent, we want to position ourselves to be a content provider,” Jonske says. In line with that objective, M has jointly published with the American Bar Association two guides for practitioners, one six months ago on long-term-care products and the other on life insurance in 2011. Reinsurance is one of those mysterious businesses you only hear about when it’s in trouble or causing it. Yet M Financial Re, the reinsurance subsidiary of M Financial Group, is central to its parent’s success. M’s early leaders wanted insurers to develop customized products for their elite clients’ unique needs, and offering to share in the risk of such products as a reinsurer seemed like a good way to entice them to do it. So three years after M’s 1978 founding, M Financial Re was created. Here’s how it works: When a client buys a policy and the premium is, say, $10,000, the carrier’s cost to acquire that business might amount to $4,000. “So the insurance company has $14,000 to fund,” explains actuary Randy O’Connor, chief financial officer of M Financial Group. The first $10,000 comes from the premium. The carrier has to cover the remaining $4,000. “Most life insurance companies lose money on a cash basis on the day a policy is written,” according to O’Connor. This strains the carrier’s surplus, which must be maintained at certain levels in order to grow as well as meet state insurance department requirements. Enter M Financial Re. It puts up half the carrier’s out-of-pocket cost, or $2,000 in this example. “Under our modified co-insurance treaty with M’s carrier partners, when they issue a policy to our client they bill M Financial Re for half the surplus strain and we write them a check for it,” O’Connor says. “We have the largest proprietary life-information database about our target market in the world. We protected it in Europe” under intellectual-property laws there, says O’Connor. The statistics show that life policies sold to the wealthy typically remain in force longer than other buyers’ policies. Reasons include the lengthier life spans the affluent enjoy, their wherewithal to continue paying premiums and their propensity for placing policies in trusts, where lapsing occurs less frequently. On the expense side, these customers offer efficiencies. The large-face-amount policies they purchase are not much more costly for a carrier to administer than small ones. Opinions and estimates contained in this article are subject to change without notice, as are statements of financial market trends, which are based on current market conditions. This article originally appeared in the November/December 2013 issue of Private Wealth Magazine. All rights reserved. Charter Financial Publishing Network, Inc.
During 2012, Pinnacle Financial Group grew and evolved thanks to the trust, support, and collaborative energy of our valued clients and partners, as well as the expertise and dedication of our consultants and staff. In fact, Pinnacle engaged on behalf of clients on so many fronts – life insurance, health care reform compliance, qualified plan regulatory compliance and more – that we wanted to share some highlights from across our practice areas with you to keep you informed of all the ways Pinnacle is leading the marketplace in services, products, analysis and technology. Click here to view our 2012 Annual Review. Michael Mingolelli, Jr. contributes an article to the Association for Advanced Life Underwriting’s (AALU) Winter 2012 edition of “The Quarterly”, discussing the challenges and opportunities ahead for growth-focused firms. To read the full article, please click Download PDF below. Many individuals think of life insurance as a financial transaction, a necessary one-time event or a “set it and forget it” measure to provide a degree of security for their family. For family businesses, it can be a valuable tool, where you’ll find treating life insurance as a financial investment is a smarter and more responsible way to protect your family and ensure a smooth transition in ownership of the business you’ve worked so hard to grow when the time comes. Additionally, treating life insurance as an active financial asset can provide some surprising financial advantages from which your business can benefit – while you’re still alive and kicking. Michael Mingolelli, Jr. shares his insights about how life insurance can serve as a valuable tool to family businesses, providing both short- and long-term financial benefits. To read the full article, please click to download PDF below. Traditionally, life insurance planning discussions with high-net-worth individuals focus on estate tax mitigation, estate liquidity and estate equalization. What about high-net-worth indiciduals and familyies who have sufficient liquidity to pay the estate taxes? Can life insurance serve as an invaluable tool in their wealth management strategy? In our opinion, the answer is a resounding “yes” – it can be used as a unique portfolio hedging technique. Traditionally, life insurance planning discussions with high-net-worth individuals focus on estate tax mitigation, estate liquidity and estate equalization. What about high-net-worth indiciduals and families who have sufficient liquidity to pay the estate taxes? Can life insurance serve as an invaluable tool in their wealth management strategy? In our opinion, the answer is a resounding “yes” – it can be used as a unique portfolio hedging technique. For the full article, click the pdf below.